Hello, this is our KIMBA. Born December 20,2010. We took ownership March 17th 2011. She is extremely fussy on what she eats ( like it today/hate it tommorrow) she is too skinny for my liking, GSD owners have told us that will change as Kimba ages. I work for a meat wholesaler and supplement her diet with my cooking (she loves sirloin tips cut in cubes mixed with mashed sweet potato/bananas or apples) no fussiness there. Thanks so much for taking the time to share your German Shepherd puppy Kimba with us. She is absolutely gorgeous by the way. And yes, she will fill out more once she gets to be about 2 years or so, so if she looks skinny to you now, that is very normal for GSD puppies. As long as she is happy, playful and energetic I would not worry too much about her being a little thin. Good luck with her and keep the updates coming in later on. And thanks again. Kimba is Beautiful! She doesn't look too thin to me. She looks healthy and you shouldn't worry about her weight, she will fill out more as she gets older but importantly not to heavy, its bad for their joints. I don't think it is a good idea to make her food from scratch it will make her a picking eater and will get use to it and don't want to eat "dog food", to get all the vitamins and nutrients she needs to grow healthy and strong. 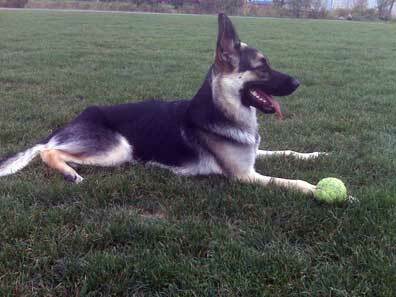 I recommend a premium dog food, Mia my GSD gets Pro Plan and I trust Purina. Once in a while give a some steak choppped in her food or a strip of bacon for a little treat. She must love playing with balls, good exercise. Take care of your Protector and she will take care of you! Thank you, Glen, for sharing about Kimba. I love her photo with her ball. My Chloe also loves her balls! She will be 10 months old on April 29th. They are so very precious!